For the past few weeks, Lisa’s had one song stuck in her mind, with the line “ball of confusion” (the Love and Rockets version – gotta love that 80’s hair!) playing endlessly. The ball has finally been sorted! When last we spoke, our lives had been turned upside down by two phone calls: one from the bank and one from our immigration lawyer. Of course, both arrived on the same day, while Lisa was in Canberra for some intense research meetings. Tired, and in serious need of a glass of wine, she was chilling in her hotel room (post-meeting; pre-dinner) when call #1 arrived. Uh, yes, well.. the bank had made just a tiny little error. Nothing serious, mind you… they just ticked the wrong box, by mistake. 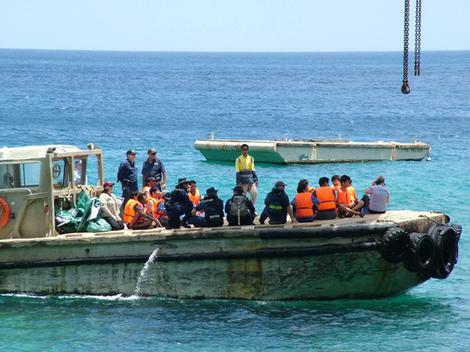 Some days, it seems like things might have been a bit easier if we just got a refugee boat to drop us on Christmas Island. That box was on a form for a home loan, as we had just put in an offer on a house. That box said that we were “permanent residents” when, in fact, we were just “temporary residents, here at the whim of Australian immigration” (okay, that’s probably not what the tick boxes say, but you get the idea). How to resolve this tiny little error? Um… no worries! Just come up with a 20% deposit on the house, so we don’t have to get the mortgage insured. In other words, find $80,000 cash. Yipes! Our mortgage was in jeopardy! Ah well, no worries — our PR application is in and should be settled any day now. She’ll be right, mate! Yeah, well… not so fast. Enter phone call #2 — from our immigration lawyer. Um… yeah, well, DIAC is wondering why your police clearances look different. Lisa’s is just a formal letter from a chief of police, while Dan’s has really cool looking fingerprints attached. They didn’t like Lisa’s official police clearance — they wanted fingerprints. Now! And the PR status was not going to happen without them. Okay – so for a bit of back story read this earlier post. We were so hopeful back then! At that time, we were waiting for Lisa’ s parents to receive the magic letter from the Owen Sound Police, providing her clearance. Success! It arrived at her parents’ place within days, they couriered it to Australia, the immigration lawyer submitted everything to the government… and, we waited, again. A few days later, Lisa receives an email from the RCMP, saying that the quality of her fingerprints was too poor for analysis (“damn you, Wagga police station!” she thinks); the file is being returned to Australia. Weeks go by before the offending packages comes in the mail. Ah – no worries! The police check done in Owen Sound will fit the bill! Oh, you are so wrong to think that… Now we jet ahead to that hotel room in Canberra, where immigration has decided that pretty pictures of Lisa’s fingers are needed to secure PR. It only took them many weeks to make this decision! And so, what to do? Return to the Wagga Police for round #2 of the ink prints (i.e., could take up to 4 months for the RCMP to process, if – and that’s a big “if” – the prints are of good quality). Or, wait until the next time you’re in Canada, where you can do digital prints with a 72-hour processing time? Hmm… (and yes, Lisa begged the RCMP to allow her to do digital prints from Australia; no luck! Apparently, the RCMP doesn’t trust the local or federal police here in Oz – or any other country. Go figure! According to our lawyer, even the FBI allows digital from outside of the USA now. Canada? We’re more secure… or something). Now, this normally wouldn’t be a big deal, esp. as Lisa has a conference in Canada at the end of May. She could just wait a few weeks and deal with this. However — you must remember that phone call #1 has already happened. We put an offer on a house (in good faith! ), but the bank ticked the wrong box. Now, we have a vendor who is fuming, two lawyers who are waiting, a rental agent getting nervous… What a mess! Now, we might have let the house go back on the market — but the other wrinkle was that the lease on our rental house was set to expire mid-July. Since the process of buying a house can take a few weeks, and since Lisa was going to be away for two weeks for her conference, we realized that we (and our three kitties!) could be completely homeless if this wasn’t sorted – and quick! Living in a defense house we are always on borrowed time, with no guarantee that we could extend the lease for another few months. Talk about a rock and a hard place! The solution? Easy! Hop online: book a flight from Sydney to Vancouver with airline points (thankfully, Lisa has a shitload of points! still costs $850 in taxes and such); book a flight from Wagga to Sydney ($300); book a hotel in Sydney (must overnight there due to crazy winter fog in Wagga, which regularly delays early morning flights – cost, $200); and, book a hotel in Vancouver for one night (cash in Starpoints, so only costs $45). Make plans for fingerprinting (i.e., Commissionaires – $85), visits to banks in Canada to organize contingency funds if needed, and other errands that can only be done in country. Email boss to describe crazy life circumstance and book personal leave. Reschedule 20+ meetings, begging forgiveness from all concerned and providing the best excuse, ever, for rescheduling! Make an online booking at an amazing place for lunch ($29 for a three-course meal at Market, plus wine – and yes, there was wine!). Download a ton of movies to watch on the IPad during the flights. Pack only a carry-on with survival items to get through the airports quickly. 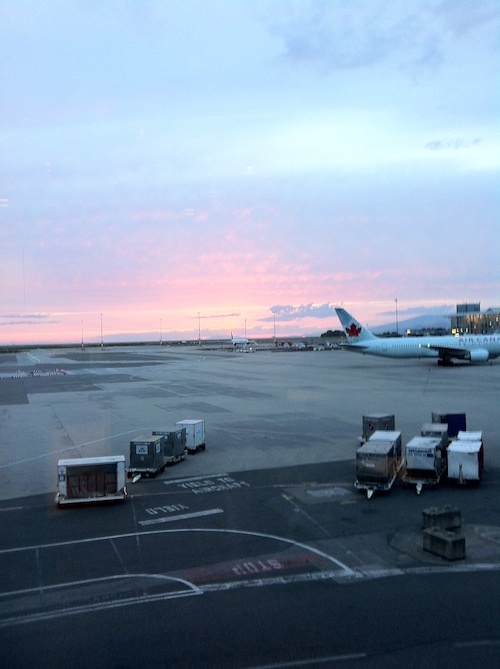 More time in the air than actually in Vancouver – and a lot of time sitting in the Air Canada lounge at YVR. At least there was a nice sunset. So, apologies to those readers in the Vancouver area! Yes, Lisa thought of calling you while she was in town… but she was far too stressed (and jet-lagged, and stunned) to deal with being social. She was on the ground for about 36 hours, either sorting out the to-do list or trying to catch up on sleep. When arriving in Vancouver she had a very set timeline to get everything done. First up – a shower at the Fairmont Vancouver Airport. A little known (but important!) travel fact: Fairmont President’s Club members (it’s free to join!) get free access to the health club, including showers! For a flight that arrives at 8am, with a full day ahead, this is crucial. Shuttle to airport hotel, check-in (i.e., leave suitcase), train to downtown, fingerprint visit #1. This was interesting, as it turns out that Lisa’s left hand is defective! Almost no fingerprints (so the system kept “failing” her fingers). The commissionaires staff tried lotion, re-rolling, and even pulled in an expert (i.e., older) staffer to give it a best shot. In the end — 3 good prints, a letter to the RCMP that we “tried our best!” and a call to come back that afternoon for confirmation of fingerprint acceptance. If all else failed, Lisa was advised that she might need to buy a bottle of olive oil and soak her hand overnight to see if the prints would come up (seriously!). Then on to banking, lunch, a second visit to the Commissionaires to check on the prints — and yes, the RCMP accepted them! Yay! More banking and errands. Stumble around the streets of Vancouver trying to determine if you’re really on another continent or not. Consider going to Fluevog, only to realize you have no spare room in carry on luggage (Damn!). Kill time wandering. Go to dinner at Cactus Club. Watch an episode of Sons of Anarchy; watch another episode; and another. Stay up as late as possible due to time zone. Sleep in until 11am (thank stars for late check out!). Have lunch. Check out. Shuttle to airport. Hang in airport lounge for 10 hours… and, you’re done! Mission accomplished! Fly home. Sleep. Shake head at crazy week. Try to adjust to being home in Australia. Done! And, luck was on our side. The RCMP did their job within just two days and Lisa’s parents received the letter (like gold!) and sent it by courier to the lawyer in Sydney (thanks Dad – you made it all work!). Courier took two business days, it was off to immigration immediately… and, we’re thrilled to report, we are now the proud owners of PR status! We are now one step closer to being “real” Aussies (we qualify for Medicare, at least!). And yes, the house is coming through, too… details on that to follow. 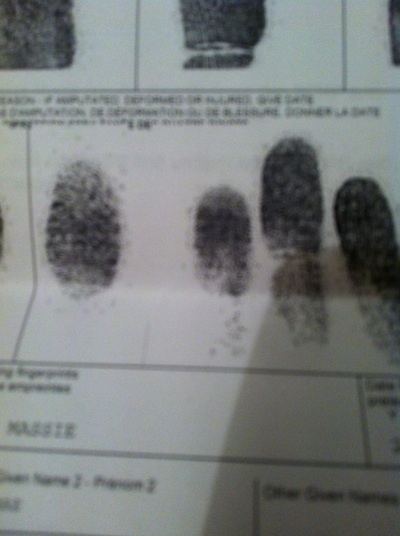 This entry was posted in airport, Australia, fingerprints, travel, Visa, wagga. Bookmark the permalink. Sweet jebus. Glad everything is sorted out! Oh wow. Now my in-house expert says the coppers who did the ink prints used too much ink. And that olive oil trick sounds like hokum. If you need them done again she’ll happily travel to you with her kit! 😉 Glad it’s sorted! You should see the incredulous look on Wen’s face now! Wow! It’s done and congrats on the PR status! !